· 1. Our LPG stoves are energy saving, having high thermal efficiency of minimum 68% and are manufactured as per IS:4246. As per studies the High thermal efficient LPG stoves save LPG . · 2. Manufacturers are authorized by BIS under a special amendment to their license. · 3. Internal Quality checks are done by the manufactures ,in addition to this random checks are performed by IOC official also. This type of quality checks are missing in open market. · 4. Copy of internal Quality control certificate as per BIS guidelines is included in each and every package of stove. The burner top is made from using high-quality brass, procured from reliable vendors. Clients can obtain our burner tops in different sizes and finish as per their requirements. 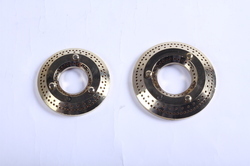 We coat Gas Stove Brass Burner with anti-corrosive materials and offer to clients at the affordable prices. 2 Burner Glass Top Gas Stove comes with toughened glass top, these gas stoves enhance the beauty of every kitchen. We offer an exclusive range of 3 Burner Oval Glass Gas Stove which is available in the fabricated using premium quality material; Very uniquely designed comes with a 3 burner joint less body under the glass which makes it strong and heavy. The unique feature of this product is that it can also be used even if the glass is broken due to some extreme circumstances. 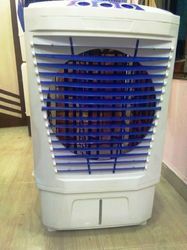 These are high performing and energy efficient. These gas stoves are quality tested and provided in the customer-friendly packaging. These are highly efficient stoves thus saves fuels. This stove is having long life digital printed on glass. We also supply a premium range of 4 Burner Glass Gas Stove and is known as for its exceptional fuel efficiency and durability. Provided with a specially toughened glass, these gas stoves are comprehensively designed to perfection by our skilled professionals. We manufacture these stoves from superior grade Stainless Steel to ensure a long lasting life. 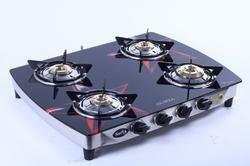 These are further provided with a heat resistant knob and fuel-efficient burner to ensure faster cooking. 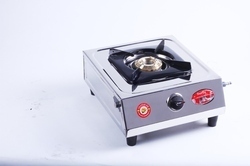 Available in many customizations, these gas stoves are widely demanded in the market and are earning customer appreciations. 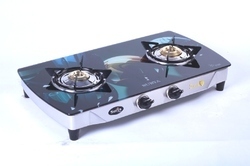 We are offering 3 Burner Digital Glass Top Gas Stove to our client. We make available to our clients, a comprehensive range of Single Burner SS Gas Stove that exhibits a perfect blend of attractive looks and high performance. 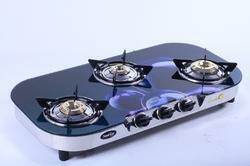 Our skilled professionals designed these gas stove precisely to make them meeting all International Quality Standards. We make use of quality stainless steel to fabricate this range of gas stoves. Care Home Industries had started their operation in 1987 and since then we have grown to become one of the major manufacturer, exporter and supplier of a wide assortment of gas stoves. We follow high standards of manufacturing so that these can please the variegated taste of our customers. 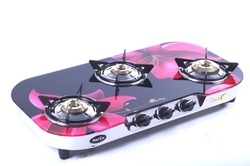 We offer gas stoves, single burner gas stove, two burner gas stove, three burner gas stove, four burner gas stove, gas stove with glass top, glass cook top, gas stove with top cover. The main driving force behind our success is the hard work and dedication of our entire team, which comprises of a bunch of skilled and experienced professionals. We conduct strict quality control checks on our range that help us in maintaining high quality standards in product range. In addition, our state-of-art and sophisticated infrastructure enables us to meet the bulk demands of our clients within stipulated time frame. We are exclusively looking for clients from Philippines, Thailand, Sri Lanka, Malasiya,Asian Market, African Market and also looking forward in exporting across the world.